The term potash has more than one meaning. In a narrow sense, it refers to the salt potassium carbonate (K2CO3). In a broader sense, it is a generic term for various water-soluble potassium salts that may be mined or manufactured. 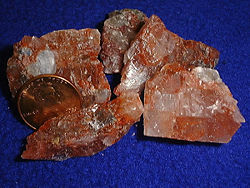 Potash has been used since antiquity in the manufacture of glass, ceramics, and soap. Today, potash (in the form of potassium oxide) is used mainly as a fertilizer. The name is derived by combining the English words pot and ash, referring to its discovery in the water-soluble fraction of wood ash. The element potassium was named after the word potash. The term has become somewhat ambiguous due to the substitution in fertilizers of cheaper potassium salts, such as potassium chloride (KCl) or potassium oxide (K2O), to which the same common name is now sometimes also applied. In addition, potassium hydroxide (KOH) is commonly called caustic potash, an additional source of confusion. Various chemical compounds containing potassium have the word potash in their traditional names, as noted in the table below. Prior to the twentieth century, potash was one of the most important chemicals in the industrialized West. Extracted from the ashes of broadleaved trees, it was produced primarily in the forested areas of Europe, Russia, and North America. The first U.S. patent was issued in 1790 to Samuel Hopkins for an improvement in making "Pot ash and Pearl ash by a new Apparatus and Process." In the late eighteenth and early nineteenth century, potash production provided North American settlers a way to obtain badly needed cash and credit as they cleared their wooded land for crops. To make full use of their land, excess wood, including stumps, needed to be disposed. The easiest way to accomplish this was to burn any wood not needed for fuel or construction. Ashes from hardwood trees were used to produce lye (potassium hydroxide), which was in turn used to make soap or boiled down to produce potash. Hardwood could generate ashes at the rate of 60 to 100 bushels per acre (500 to 900 cubic meters per square kilometer (m³/km²)). In 1790, ashes could be sold for $3.25 to $6.25 per acre ($800 to $1500/km²) in rural New York State—nearly the same rate as hiring a laborer to clear the same area. The refined potash was in increasing demand in Europe for use in the production of glass and ceramic goods. American hardwoods, besides being more abundant, are said to have provided a higher yield of quality potash than European wood. In some parts, potash receipts became a common form of currency. Some settlers found potash production to be quite lucrative. Unfortunately, this approach to generating fast cash increased the pace of deforestation, adversely affecting the wildlife and ecosystems of those areas. Today, 14 countries produce most of the world's supply of potash, by mining and manufacturing processes. The main supply comes from Saskatchewan, Canada, and additional supplies are generated in Russia, Belarus, Germany, Israel, and Jordan. Among them, Israel and Jordan use solar evaporation pans at the Dead Sea to produce carnallite from which potassium chloride is produced. Northeastern Thailand's Udon Thani province has also been identified as one of the world's richest potash reserves and could potentially become a major exporter of the mineral. Mining of this area, however, has been delayed by public opposition. Many villagers who live directly above the proposed mine site have expressed concerns about adverse effects such as land subsidence and salinization of groundwater and soil. These effects would threaten the economic stability of local communities that rely primarily on rice farming for survival. ↑ Potash USGS Minerals Information. Retrieved October 9, 2007. Highley, David, et al. 2006. Potash British Geological Survey. Retrieved October 9, 2007. Keesler, M. Paul. 2002. The Yankee Invasion: They Burned The Woods and Sold the Ashes Mohawk: Discovering the Valley of the Crystals. Retrieved October 9, 2007. The First Patent Invention & Technology, Fall 1990. This page was last modified on 27 May 2015, at 16:41.